BANDIPORA, FEBUARY 10: A week-long campaign under 30th Road Safety Week concluded at Bandipora with a valedictory function organised at Mini Secretariat Bandipora wherein several officials, journalist and civil society members were felicitated for taking an active part in the week-long activities. Superintendent of Police, Sheikh Zulfikar Azad was the chief guest on the occasion while Sub-Divisional Magistrate Gurez, Rafiq Ahmad Lone, Tehsildar Bandipora Rouf Iqbal, BDO Mir Murtaza and other district officers, various stakeholders including transporters, students from different institutes and journalists were also present. SP Bandipora Sheikh Zulfikar Azad emphasised that the campaign initiated under the Road Safety Week shouldn’t end up with valedictory function but the stakeholders should endeavour to make it a regular activity to achieve the vision envisaged under the campaign. He complimented the Motor Vehicle Department especially ARTO Bandipora Moazam Ali for spearheading an intensive awareness campaign under Road Safety Week and asked officials of the department to make it a regular activity in the district in well-knit coordination with district police, traffic authorities and other stakeholders. Detailed discourses on various aspects of road safety such as traffic rules and regulations, traffic signals, ills of over speeding, drunken driving and overloading besides role of students and civil society in spreading the message of road safety were carried out. 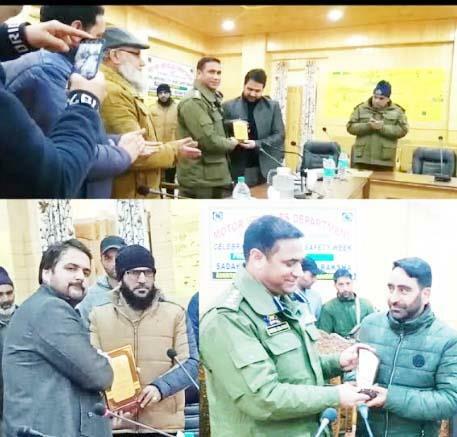 Later SP Bandipora along with other officials felicitated the students, media persons and transporters for actively participating in the week long campaign.